Resonance changes with the Now. It is woven into time and achieving a collective resonance is about paying attention to the "road" that we are on together, and responding in real time. The root tone is great to tune to, but it is not the resonance. What has worked before can inform how we respond and create now, but is not the answer to today's challenge. Time embeds new questions. In organizations we can see the tendency to attempt to make templates and SOP's, to take new problems and turn them into a nail that can be addressed by the hammer that we know, and are holding in our hand. Organizational systems often are set up to support this replication through guidelines, rules, evaluation, and rewards systems.
. Music is a powerful connector and a universal unifying principle. It is quickly recognized, and humans make deep, memorable associations when they hear music. "The event was truly a success — a 10! We loved every aspect of the FTM event. Here you have a tool that may be as old as language—certainly older than PowerPoint, or even the flip chart—that is a missing "fundamental constituent" in many of out organizational learning experiences. Brain research shows that in hearing or performing music, networks of neurons must form abstract representations of the musical structures. This creates an altered, awakened state in which the person is more receptive and pliable, and ultimately, more creative. It actually helps us get closer to when our brains were most maximally receptive—when we were a child. This helps create a state where, say, innovation or change is encountered differently. Music activates the medial pre-frontal cortex and creates strong memory associations, and its use in your program makes the program and its content more accessible after it is over. —The experiential of music involves cognitive function and logic. The participants analyze the task at hand and through proposed discussion questions, develop themes, sub themes, issues, and "data." It's basically a logical brainstorming process where they generate ideas, process and evaluate them, and make decisions about which to incorporate into their "product," their song. —The process of using music engages emotions and feeling. People get in touch with how they are feeling about their situation and their issues. In many business environments emotions are not necessarily encouraged, so participants often welcome the opportunity to express their feelings. They have fun exploring and naming the emotions they experience at work, and in finding common ground and understanding with their collaborators. The process itself generates enthusiasm and there is often a common experience of fear and performance anxiety, which ups the emotional ante and eventually the payoff. —In these programs there is the hands on activity of creating and performing—using the whole body by the end of the process. There is also the question of what action, what to-do's, to take on going forward. After reflection and discussion on what is created, presented, and learned from the activity, as well as what they learned from being in the process and witnessing their cohorts do the same, participants explore actions they can commit to back on the job. This enables them to make use of the insights learned to make a concrete impact. As well as using music and songwriting as an interactive experience to find organizational resonance, you can use the power of music throughout your event or meeting. A musical theme can reinforce the ideas that are being presented and discussed, play-on's and play-off's for speakers can add life and punctuation, and the background music playing when people enter makes a statement and sets a tone. These soundscapes can be useful and effective. Music makes very strong associations, and you want that to work for you. We compose new songs and music for clients, so that the music stands alone making a new association with the event, the organization, the people, and the themes present. The people reach the place of resonance, and can use the experience as a reference point—"We've done it, we know how to do it, and we can use this going forward." May you have a resonant Holiday Season, and a Harmonious New Year!! As we approach the end of 2014, FTM was charged with having to create yet another holiday card. Our sales guru suggested sending them out before Thanksgiving and beating the rush. Did you get yours yet? The psyche of Face the Music is complex, one needs to understand that us creating a card is like making a great work of art or, to put it another way, like having a baby. 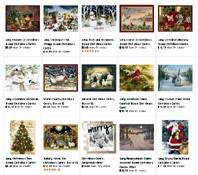 We searched our catalog of FTM holiday cards from the last 15 years for inspiration. 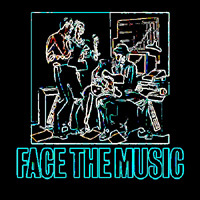 2013 was a good year for us, so we decided not to send cards but to send out Face The Music logos both in dark and milk chocolate. (a lot of those didn't make it out of the office). Here's a quick review of some of our more notable cards that mostly have nothing to do with the holidays, it should be noted that Paul Kwiecinski was the photo editor and creator of many of Face The Music cards. : Sinking Raft: 4 of us are literally (no Photoshop here, except the FTM banner in the background) on a raft that appears to be sinking in the middle of a pond located on the FTM headquarters grounds. The men are dressed in ill fitting suits and the office manger looks lovely. Talk about a balancing act! Special note- the center photo of this card was ominous black and white w/ color over tones of the team band shot in darkness. : Seasons: An introspective of the Face the Music office seen in summer, fall and winter. As a poetic jest, spring omitted because it was coming. : Atwood Road: Was shot on location in Stone Ridge, New York on the famed Leggett Road cross walk. Wonderful work from the late and great photographer Jason Martin. We miss you. : Three Horsemen and Woman: Having our CEO as Alumni of Notre Dame has its perks .This card is adaptation of The Four Horsemen of Notre Dame: a photo taken in 1924 of Notre Dame's famed backfield. Can you find the football? We wish you a happy healthy holiday season and keep a look out for our 2014 (most probably award winning) card.